In an unmistakable snub, President Barack Obama left Pakistan off a list of nations he thanked for help getting war supplies into Afghanistan. The omission speaks to the prolonged slump in U.S. relations with Pakistan that clouded a NATO summit where nations were eyeing the exits in Afghanistan. Tensions that Obama readily acknowledged raise questions about whether Pakistan will help or hurt the goal of a stable Afghanistan. Continued mistrust between the United States and Pakistan also threaten cooperation to eliminate al-Qaida sanctuaries and could undermine U.S. confidence in the security of Pakistan’s growing nuclear arsenal. Pakistan is not a NATO member but was invited to the summit Sunday and Monday because of its influence in next-door Afghanistan and its role until last year as the major supply route to landlocked NATO forces there. Pakistan closed those routes after a U.S. attack on the Pakistani side of the border killed 24 Pakistani soldiers in November. The last-minute invitation from NATO to join the Chicago talks was a sign of hope that the rift had healed. But it hasn’t. And Obama’s dealings with Pakistani President Asif Ali Zardari made that clear on Monday. Zardari came to Obama’s home town expecting a separate meeting with the U.S. leader like the one accorded to Afghan President Hamid Karzai. But without a final deal to reopen the supply lines, no such meeting was to occur. That was after Zardari had to sit by as Obama opened Monday’s session with public thanks only to the nations north of Afghanistan who allowed expanded supply shipments to transit their territory to compensate for the closed Pakistani border gates. “I want to welcome the presence of President Karzai, as well as officials from central Asia and Russia — nations that have an important perspective and that continue to provide critical transit for ISAF supplies,” Obama said, referring to the International Security Assistance Force that is fighting the war. Pakistani officials played down the snub. The border crossing dispute is stuck over how much the U.S. will pay Pakistan to allow trucks to transit its territory. Before the airstrike, the U.S. paid about $250 per truck. Now, two U.S. officials said, Pakistan wants $5,000 a truck and an apology for the deaths in the airstrike. The Obama administration has said it was willing to pay as much as $500 per vehicle and has expressed condolences and regret, but no apology. The officials spoke on condition of anonymity because the negotiations were being conducted in private. The prospects for reaching a deal were unclear, even as the stakes grow larger. Obama told reporters at the close of the summit that he knew beforehand that there would be no deal on the supply routes now. Zardari also met with Secretary of State Hillary Rodham Clinton on Sunday and made a beeline across a meeting hall to grasp her hand again on Monday morning. The State Department said Clinton and Zardari “discussed the importance of reopening the NATO supply lines,” and of cooperating to fight terrorist threats. The U.S. and Pakistan have a history of troubled relations that started well before the terrorist attacks of Sept. 11, 2001. The road has grown only rockier since then. Despite giving Pakistan billions of dollars in aid over the past decade, anti-Americanism is widespread in Pakistan. And after years of sometimes meaningful cooperation in hunting down al-Qaida figures, Pakistan is still seen by many U.S. officials as double-dealing and unreliable. 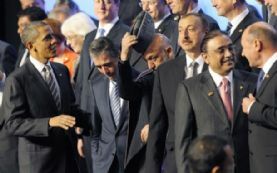 The transit route issue was a distraction and an embarrassment for the United States at the summit, and Obama’s cool arm’s length treatment of Zardari made it look even worse for the Pakistani president. “Pakistan has to be part of the solution in Afghanistan, and it is in our national interests that to see a Pakistan that is democratic, that is prosperous and that is stable,” Obama said. The quarrel over supply routes is intertwined with several other disputes, including Pakistan’s opposition to U.S. drone strikes against terrorist targets inside its borders. In addition to closing the border crossings in response to the November attack, Pakistan ordered the U.S. to vacate Shamsi air base, which the U.S. was using to launch drone strikes at al-Qaida and Taliban militants. The top allied commander in Afghanistan, Marine Gen. John Allen, has tried to cast the supply route problem in the best possible light, while acknowledging that he’d like to see the border crossings reopened as soon as possible. Allen said Sunday that by some measure, war stocks are higher now than when the crossings were closed. That is thanks to an increased — and much more costly — use of alternative routes, including a network of northern routes that connect Baltic and Caspian Sea ports with Afghanistan through Russia and Central Asia and the Caucasus. And they combine sea, rail and truck transport and are more costly than crossing Pakistan by land. U.S. officials have offered a range of estimates on how much the closing of the Pakistani land routes have added to the overall supply costs, but it apparently is at least two or three times more expensive to move supplies by air and via the northern route. To underline the value of those alternative supply routes from the north, Defense Secretary Leon Panetta met Monday in Chicago with his counterparts from the central Asian nations of Kazakhstan, Kyrgyzstan, Tajikistan, Turkmenistan, and Uzbekistan. He expressed his “deep appreciation for their support” of the northern supply route, Pentagon press secretary George Little said. At least as troublesome as being forced to use alternative supply routes into Afghanistan is the issue of how to get war materiel out of the country as Allen begins the withdrawal of thousands of U.S. troops this summer. That’s because the withdrawal includes shipment of vehicles and other equipment that would be costly and time consuming to remove by air. The NATO alliance needs Pakistan’s cooperation to ensure Afghanistan’s long-term stability and security, NATO’s top officer told reporters. That was a mild way of saying that Pakistan can play the spoiler at will and holds cards the fighting force does not. Pakistan shares history, culture and language with Afghanistan’s restive southern swath, and maintains support for Taliban-led insurgents who cross the border to kill U.S. and NATO forces.